It is law school application season. This is extremely apparent to me as I am working in my school law admissions department this semester giving tours and helping with events. Not only are people applying to law school, there are tons of prospective students touring the school and calling with questions. 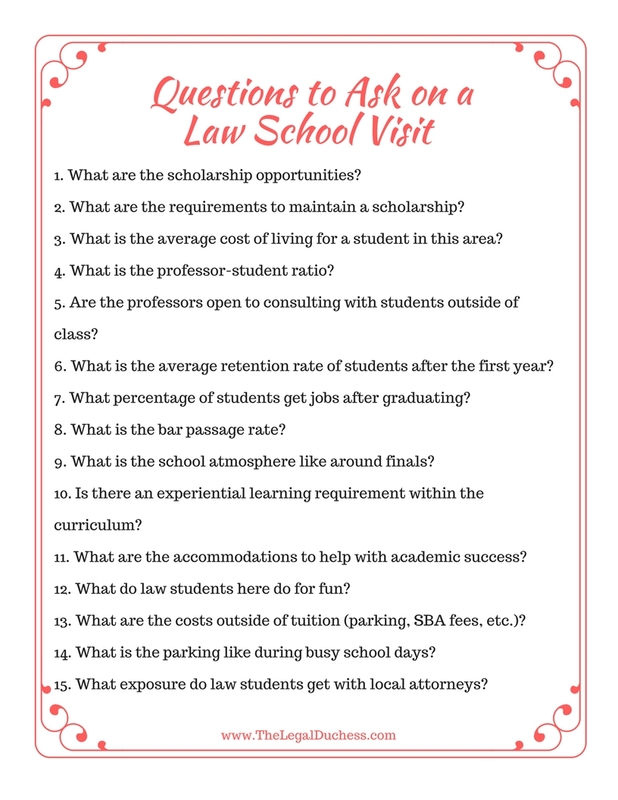 I recently had a reader write in requesting a post about questions to ask while visiting a prospective law school. This is such a great idea and I think will be so beneficial to many prospective students. 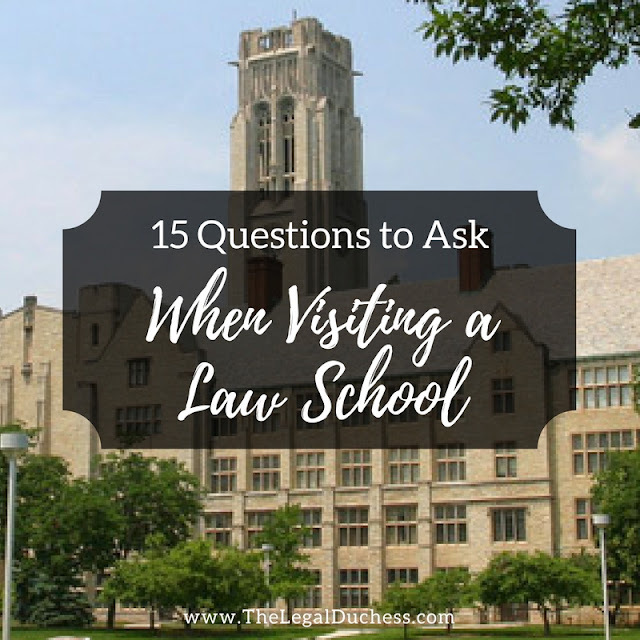 So from a mix of my own experience, what I have witnessed on tours and what I wish I would have known, here are 15 questions every prospective law student should ask while visiting a prospective law school. 1. What are the scholarship opportunities? It is important to know what opportunities are available to help finance your education and what GPA/LSAT will make those scholarships a possibility for you. 2. What are the requirements to maintain a scholarship? Some schools require a minimum GPA to maintain a scholarship while other schools simply require you to maintain academic good standing to retain your scholarship. This is important to know because a scholarship GPA requirement will cause added stress around finals time and also you need to understand what the chances are that you may lose your scholarship and the importance having a financial backup plan. 3. What is the average cost of living for a student in this area? Every city is different and when planning out finances, it is important to know the average cost of an apartment, transportation, and food for a student in that city. This helps to plan finances as well as maybe being a deciding factor between two similar schools. 4. What is the professor-student ratio? Will professors know who you are or will you become just another face in the crowd? No matter what your preference is (big classes or small classes) this is an important thing to know and understand so you can make an informed decision. 5. Are the professors open to consulting with students outside of class? I find meeting with teachers very helpful and important. Not every law school has professors with an "open door policy". Find out what the policy is and decide if that will work for you or not. 6. What is the average retention rate of students after the first year? The nice way of asking how many first-year students drop out and fail out. 7. What percentage of students get jobs after graduating? This is super important. Law school is a means to gain a J.D. to help you have a legal career. If the jobs aren't coming to graduates from this school, that is a huge consideration to keep in mind. 8. What is the bar passage rate? In order to get a job as a lawyer, generally, you need to pass the bar. Make sure that students from that school are adequately prepared and are largely passing the bar exam. 9. What is the school atmosphere like around finals? Finals time is stressful. Pretty much the most stressful time in law school. Getting insight into how the school atmosphere changes during that most stressful time will really put it in perspective if the general atmosphere is more competitive or more like a community. 10. Is there an experiential learning requirement within the curriculum? Experiential learning is so important. Academics and learning cases and black letter law is great but hands-on experience with real-life legal work is just as important. Not every school requires experiential learning but even if they don't find out if there are opportunities for those who want it. 11. What are the accommodations to help with academic success? Law school is HARD. Even if you never have required a tutor or any kind of academic support in the past, this may be the time you do. It is good to know if those services are available if the need should arise. 12. What do law students here do for fun? Law school simply cannot be all work and no play- find out what fun things these law students do outside of class and decide if that sounds fun to you. 13. What are the costs outside of tuition (parking, SBA fees, etc.)? It's not just tuition and books that are expensive- there may be many other hidden fees to consider in your overall decision. 14. What is the parking like during busy school days? Parking can be the worst part of college campuses. It is important to know if a lack of parking is a consistent problem at this school. 15. What exposure do law students get with local attorneys? Networking is such a huge part of the legal field. Opportunities to network with local attorneys may lead to internships and jobs. I truly hope this helps all the future law students reading who may be conducting law school visits in the future. I highly highly highly suggest making an in-person visit to the schools you are considering- it is the best way to determine if that school has the feel you are looking for. I added a printable version of this list below. Best of luck to all in the midst of law school applications!